Justin Gatlin and Tyson Gay have qualified for London 2012 with sub-9.90 second times at the US trials. 2004 Olympic champion Gatlin clocked 9.80 in the 100m ahead of Gay, who finished in 9.86. The US team's third sprinter will be Ryan Bailey, whose time of 9.93 was one hundredth of a second ahead of Michael Rodgers. The first five to finish all dipped under 10 seconds, with Darvis Patton finishing in 9.96. 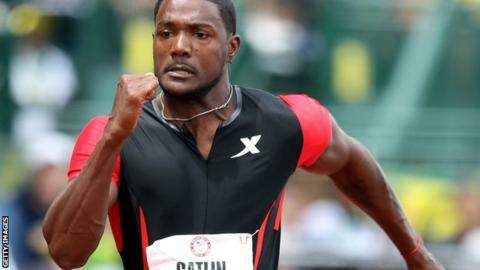 It will be Gatlin's first Olympics since Athens, having missed the 2008 Beijing games due to a doping ban. "I have a lot left in the tank. This season so far has been undefeated and I'm just trying to ride that wave," said Gatlin. Dwain Chambers won the Aviva 2012 UK trials on Saturday, but his time of 10.25 was seven hundredths of a second outside the 'A' qualification time he required. The final place in the women's 100m US team will be decided by either a run-off or the toss of a coin after Allyson Felix and Jeneba Tarmoh finished in a dead heat for third place. With no tie-break procedure included in their regulations, USA Track and Field announced that both athletes will be given the choice of their preferred method. World champion Carmelita Jeter and Tianna Madison took the first two places. LaShawn Merritt recorded the fastest time in the world this year to win the men's 400m. The 2008 Olympic champion, also returning from a doping ban, finished in 44.86 ahead of Tony McQuay and Bryshon Nellum, who both recorded personal bests to complete the US trio in the event. In the women's event, Sanya Richards-Ross also recorded a world-best for 2012 so far with a time of 49.28 to finish comfortably ahead of DeeDee Trotter and Francena McCorory. Is track & field dying in the US? Read more on Is track & field dying in the US?